Imagine Austin is our plan for the future. Fueled by ideas and contributions from the Austin community, this 30-year plan for the city is based on Austin’s greatest asset: its people. The plan lays out a community vision for how the city can grow in a compact and connected way. But unlike your typical municipal comprehensive plan, Imagine Austin also covers quality of life issues beyond land use, like investing in our creative economy and advancing healthy, affordable living. Together, your local government is partnering with you for a more livable and vibrant Austin. 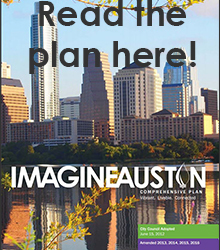 The Imagine Austin Comprehensive Plan is the City of Austin's plan for the future and provides direction for many City Departments; however, the plan is maintained by the Planning and Zoning Department's Long-Range Planning Division. On June 15, 2012, Imagine Austin - the city's comprehensive plan through 2040, was adopted unanimously by Austin City Council. The plan was created with input from thousands of Austinites and established a community vision of a city of complete communities where all Austinites have access to the amenities, transportation, services, and opportunities that fulfill their material, social, and economic needs. These communities support all ages, identities, and cultures while preserving our unique community spirit. These places are livable, safe, affordable, and accessible, and they promote healthy lifestyles, community engagement, and inclusion. Read the full comprehensive plan here. Just interested in the highlights? Read the Vision and Priority Programs in action. You may also want to read about the idea of transforming Austin into a city of complete communities or other background documents. Want to buy your own plan? Printed copies of the Imagine Austin comprehensive plan are available for $15 (plus tax) at BookPeople and Document Sales at One Texas Center, 1st floor. 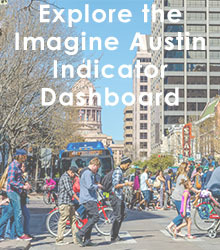 Take a journey through the past, present, and future of the Imagine Austin Comprehensive Plan by exploring this timeline. Take a look at the Sights and Sounds of Imagine Austin including live music recordings from past events! We, as staff and leaders at the City of Austin, recognize that the aspirations in Imagine Austin go far beyond typical municipal services. Doing our part to change how we do business. It is no longer business as usual at the City. Getting out of the way of the stupendous work going on all over Austin to advance the community vision! We have just started to add partner organizations that are helping to implement Imagine Austin on the website, so if we missed you or if you want to partner up, let us know. 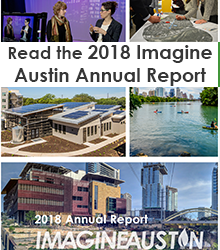 Become an Imagine Austin partner. Imagine Austin has been contacted by more than 100 cities, counties, governments, and planning and engagement organizations across the globe. If you would like to interact with us or share your research or experience, we’d love to exchange ideas and learn from each other.